JOHN ANDREOLI 6 foot 1, 215 pounds, .333 batting average over 10 games with the Daytona Cubs, Chicago’s high Class A squad. 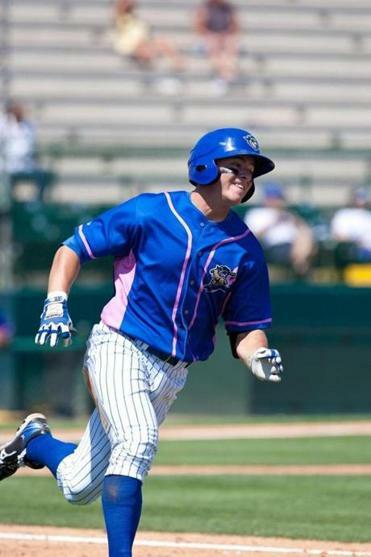 John Andreoli , a 2008 graduate of St. John’s High in Shrewsbury, has been on a tear at the plate for the Daytona Cubs, the high Class A affiliate of the Chicago Cubs. Over a 10-game span through last Sunday, the 22-year-old left fielder hit .333 (11 for 33) with a double, three triples, seven runs scored, and four runs batted in. The right-handed hitting Andreoli raised his average to .281 with 11 doubles and five triples in 76 games. His 30 stolen bases (in 43 attempts) was leading the Florida State League. “He’s a fun kid to work with and watch. He plays as hard if not harder than anyone on our team,’’ Daytona manager Brian Harper said of the former University of Connecticut standout, drafted by Chicago in the 17th round of baseball’s first-year player draft in 2011, and a Cape Cod League all-star last summer with the Wareham Gatemen. Signed last August by area scout Matt Sherman, the 6-foot-1, 215-pound Andreoli played 10 games with two Cubs rookie league teams before returning to classes at the University of Connecticut, where he hit .317 as a junior. With spring training winding down, Andreoli expected to return to the low A Peoria Cubs in the Midwest League, but made the most of his opportunity as Chicago made roster adjustments. Andreoli said Harper, a 13-year big-league catcher with seven organizations, reminds his players that the game is essentially the same between the foul lines at every level of baseball. Andreoli is eight credits shy of his finance degree at UConn. His father, John, played football at the Holy Cross and briefly with the New England Patriots, and coached his son on the gridiron at St. John’s. His grandfather, Fran O’Brien, was head basketball and baseball coach at Massachusetts Institute of Technology and head basketball coach at Holy Cross. O’Brien is hoping to return to his assistant basketball coaching job at Brandeis University following foot surgery. “Fran and my uncle, Kevin O’Brien, who led the country in hitting at Tufts, taught me so much about baseball,’’ said Andreoli, who remembers sitting in the MIT dugout at age 5. The family’s athletic ties also include two first cousins, Red Sox reliever Daniel Bard, now pitching in Pawtucket, and his brother, Luke , who pitched for the Cape League’s Brewster Whitecaps in 2010 and 2011. Originally drafted by Boston out of high school, Luke Bard pitched for Georgia Tech and was drafted 42d overall this spring by the Minnesota Twins as a junior after putting up impressive numbers (1-0, 0.99 ERA). However, he suffered an arm injury and missed the second half of the season. The Bay State Conference has named the Needham High boys’ athletic program as its Carey Division All-Sport winner for the second time in three years. The award is based on number of wins and where teams finished in the division. Newton North High was runner-up by a slim margin. The Needham boys’ tennis team had a second straight undefeated season (21-0) and was Division 1 state champ. The Rockets’ football and boys’ lacrosse teams were state champion runners-up. The Carey All-Sport girls’ award was the opposite — Newton North was first and Needham second. . . .
West Chester University junior Jamie Dolan, a graduate of Hopkinton High, has been named to the Pennsylvania State Athletic Conference second team for women’s lacrosse after helping the Golden Rams go 16-4 and advance to the NCAA Division 2 championship game, a 17-16 loss to C.W. Post. Dolan was second in team scoring with 64 points (44 goals, 20 assists) and totaled 40 ground balls, 40 draw controls, and 28 caused turnovers.